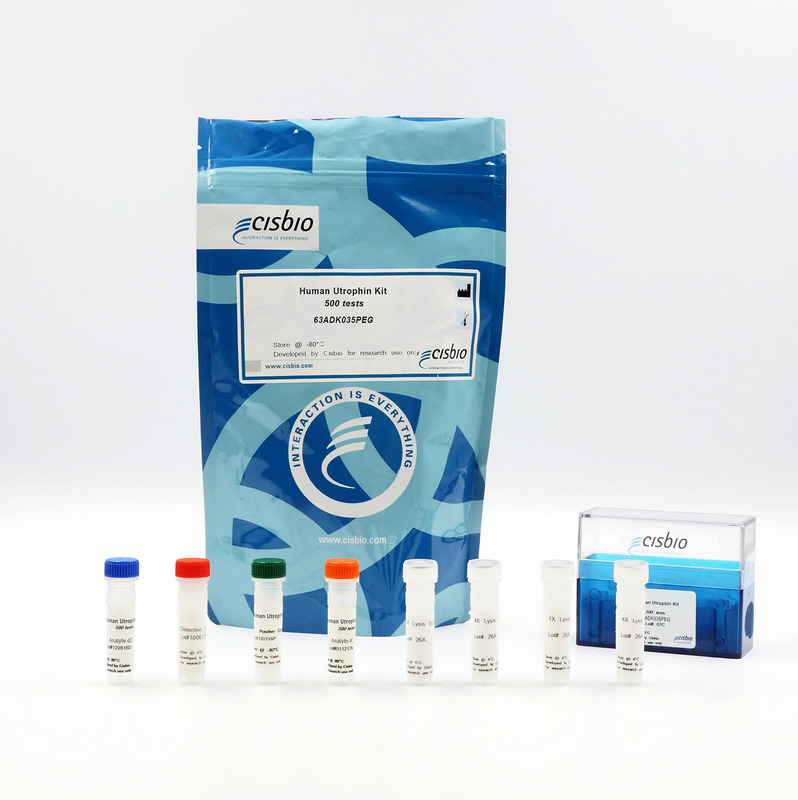 The Human Utrophin kit is designed for the rapid detection of Utrophin in cell lysates. Utrophin is an autosomally-encoded 376-kDa cytoskeletal protein that is similar in structure and function to dystrophin. It is an ubiquitously expressed protein that plays a role in anchoring the cytoskeleton to the plasma membrane. Utrophin is highly expressed in developing muscle and is enriched at the neuromuscular junction of mature muscle. In Duchenne's muscular dystrophy patients, dystrophin is lacking and utrophin is consequently up-regulated and redistributed to locations normally occupied by dystrophin. The utrophin kit is designed for a rapid detection in cell lysates. Human utrophin is measured using a sandwich immunoassay involving two specific anti-utrophin antibodies, respectively labelled with Europium Cryptate (donor) and d2 (acceptor). The intensity of the signal is proportional to the concentration of utrophin present in the sample. The human utrophin assay features a two-plate assay protocol, where cells are plated, stimulated, and lysed in the same culture plate. Lysates are then transferred to the assay plate for the detection of utrophin. This protocol enables the cells' viability and confluence to be monitored. The antibodies labelled with HTRF fluorophores may be pre-mixed and added in a single dispensing step to further streamline the assay procedure. The assay detection can be run in 96- to 384-well plates by simply resizing each addition volume proportionally.